BOTOX® Cosmetic is administered by a healthcare professional as a simple, nonsurgical treatment that is injected directly into the muscles between the brows, the forehead and the crows feet. It works by blocking communication between the nerve and the injected muscles. This reduces muscle activity that causes moderate to severe lines to form between the brows, on the forehead and around the eyes. Discomfort is usually minimal and brief. The entire procedure takes approximately 10 minutes. Most patients are in and out of the physician’s office without downtime following BOTOX® Cosmetic treatment. 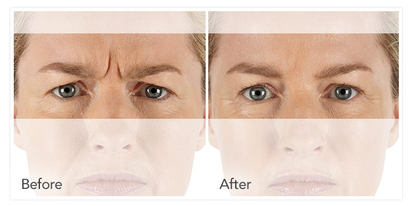 ﻿XEOMIN® (IncobotulinumtoxinA) for injection, for intramuscular use, is a prescription medication used to temporarily improve the appearance of moderate to severe frown lines between the eyebrows (glabellar lines), forehead and crows feet in adults. During treatment, which usually takes about 10-20 minutes, your doctor will inject XEOMIN® (incobotulinumtoxinA) for injection, for intramuscular use, into the muscles in your forehead that cause frown lines between your brows. No anesthesia is required.